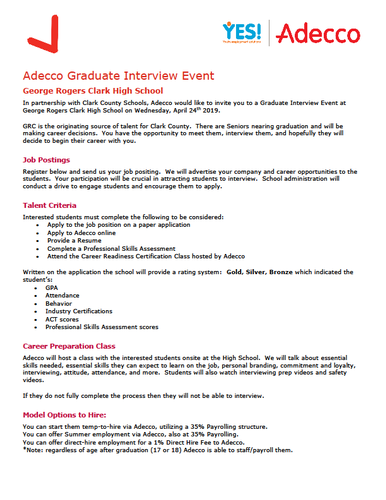 In partnership with Clark County Schools, Adecco would like to invite you to a Graduate Interview Event at George Rogers Clark High School on Wednesday, April 24th 2019. GRC is the originating source of talent for Clark County. There are Seniors nearing graduation and will be making career decisions. You have the opportunity to meet them, interview them, and hopefully they will decide to begin their career with you. Register at https://goo.gl/forms/FwvU2QV3X64bOw9Q2 and send us your job positing(s). Deadline to register is Tuesday April 9th. We will advertise your company and career opportunities to the students. Your participation will be crucial in attracting students to interview. School administration will conduct a drive to engage students and encourage them to apply. Adecco will host a class with the interested students onsite at the High School. We will talk about essential skills needed, essential skills they can expect to learn on the job, personal branding, commitment and loyalty, interviewing, attitude, attendance, and more. Students will also watch interviewing prep videos and safety videos. If they do not fully complete the process then they will not be able to interview. You can start them temp-to-hire via Adecco, utilizing a 35% Payrolling structure. You can offer Summer employment via Adecco, also at 35% Payrolling. You can offer direct-hire employment for a 1% Direct Hire Fee to Adecco. *Note: regardless of age after graduation (17 or 18) Adecco is able to staff/payroll them. Students will only be allowed to apply/interview with 3 positions. They will rank their top 3. Adecco and School will evaluate and qualify the students. We will provide the best matching of students to the job positions. The business will interview onsite at the high school. 30 minute interviews. From 8:30am – 3:00pm. We will target no more than 10 interviews per business. Lunch will be provided to the business Interviewers. The Interviewer would sit in one room and we will bring students to you. They will hand you resumes and be ready. You will also have a schedule, list, resume, and application of students so that you can prepare. After the interviews you will have opportunity to get references from Teachers/Educators. Here are some Career Pathways offered by the school which may interest you. If you want to attract students from a specific pathway please let us know on the registration page.